Businesses continually face the challenge of growing revenue, improving operational efficiency and advancing business performance to a higher level. There is a significant opportunity untapped by many companies to help meet these goals by more effectively managing document processes across the enterprise. Our approach takes the traditional managed print services model a step further by going beyond device consolidation and cost savings. We focus on the business needs associated with the printed output and apply people, process and technology to more efficiently, productively and securely address those business requirements. 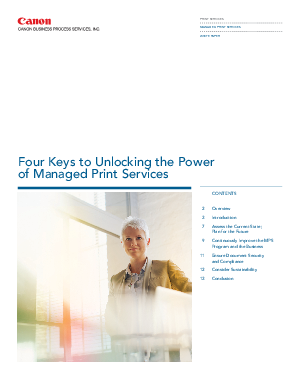 This whitepaper examines what companies need to know in order to start fully leveraging the power of managed print services to help drive success in the days ahead. In particular, it covers how to gain control over your document output strategy and marshal professional resources; how to achieve significant improved results in your managed print systems and processes including controlling costs, increasing efficiency and effectiveness and improving productivity; how to consistently ensure document control security and compliance; and how to improve document capture workflow and output management. We recommend leveraging the four key elements highlighted in this report to create programs that maximize the business value of managed print solutions. We partner with clients to deploy a staff of managed print services experts, exceptional on-site services, advanced document capture and work flow solutions.